Ċirkewwa is “an underwater palace with beautiful frescoes”. Photo: Peter G. Lemon, author of Scuba Diving Malta Gozo Comino. Greater protection measures and better enforcement are needed to safeguard marine life at local diving sites, particularly Ċirkewwa, according to two prominent divers. 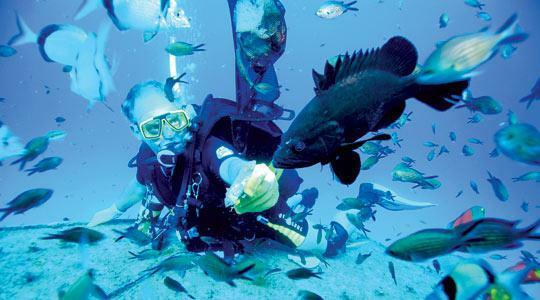 On a recent trip to Malta, Peter Lemon, an experienced British diver and author of several guides to diving in Maltese waters, said the setting up of conservation areas around wrecks, including one off Ċirkewwa, has benefitted Malta’s already lucrative dive tourism industry, which attracts up to 60,000 dive tourists annually. Describing Ċirkewwa as “Malta’s main diving gem,” Mr Lemon said since November he had seen many large groupers and huge shoals of barracudas and amberjacks in the area, so current restrictions seemed to be having an effect, but more needed to be done to create awareness and enforce regulations. “The authorities could start by making an extra effort with Ċirkewwa, either through the presence of onsite wardens or police. “The police do respond to reports of infringements, but often not quickly enough to apprehend perpetrators. An onsite presence would deter infringements in the first place,” he said. In the long term, this would benefit both fishermen and divers, since fish would breed and move out of the protected areas, according to Mr Lemon. Seven conservation areas were set around popular diving wrecks by the Veterinary and Fisheries Affairs Division (VFAD) in 2008, creating zones where vessels cannot stop and spear fishing and fishing using nets is forbidden. But current restrictions are not enough according to one prominent local diver, who is so concerned about the “almost daily” infringement of regulations at Ċirkewwa – which he describes as “an underwater palace covered with beautiful frescoes”. He has started a Facebook campaign to ‘Declare Ċirkewwa a Marine Sanctuary’, which yesterday had over 900 followers. Through the campaign, Antonio Anastasi would like to see the prohibition of all types of fishing from boats, a permanent onsite Administrative Law Enforcement (ALE) presence, clear signs at and approaching Ċirkewwa declaring it a protected area, a ban on the removal of both live and dead marine creatures from the area, and punishments for breaking the law reviewed to act as a deterrent. “The problem at the moment is that law enforcement is reactive rather than preventative. As far as I’m aware, other countries have management onsite at protected areas,” he said. Mr Anastasi believes an onsite ALE presence at Ċirkewwa would benefit ALE, helping officers to respond quicker to wildlife crimes reported around Ċirkewwa, Comino and the Marine Protected Area (MPA) between Rdum Majjiesa and Ras ir-Raħeb. He would like to see fines increased to reflect the costs of apprehending perpetrators and processing crimes through the courts, with some of the revenue used to pay for monitoring Ċirkewwa’s protected area. Mr Anastasi believes the current restrictions in Ċirkewwa leave huge gaps for other types of infringements, like the taking of sea urchins, octopus and lobster by hand. Recently, the campaign published an online petition imploring the Malta Environment and Planning Authority (Mepa) to declare Ċirkewwa an MPA ( http://apps.facebook.com/petitions/view?pid=912416793&ref=mf . The petition is sponsored by Nature Trust Malta, which has promoted the cause of MPAs over the years. Last month, Mepa announced the designation of four new MPAs, but Ċirkewwa was not one of them. Nature Trust Malta has expressed disappointment that Ċirkewwa, Delimara and the whole of Comino were not included for protection. As well as drawing attention to the areas’ rich biodiversity and Neptune Grass (Posidonia ocea­nic) meadows, NTM pointed out that Ċirkewwa offers economic value through dive tourism. Over recent months, the environmental NGO said it has been receiving reports that Ċirkewwa is a venue for illegal fishing methods including fishing with nets and harpoons. When contacted, the police denied enforcement is purely reactive, saying regular patrols are carried out at protected sites, particularly during summer. In case the police are not in a position to attend to reports, some are referred to the AFM Maritime Squadron.